Pasta has become a bad word. I don’t want to eat pasta when I touch land for at least two months. Kristy has don’t a great job with the food but we have eaten pasta everyday for the last 14 days and my body just wants a big argentine/Chilean steak with two plates of fresh vegetables. I must be getting soft in my old age. It is normal for people to start talking about food on the 10th day of a trip but normally I don’t end up with such an adversion to one particular food group. I am ready to not drink out of a sports bottle and eat out of Tupperware everyday. The last three days have been groundhog day. The same squally conditions but last night was a really doozy with massive wind shifts both direction and speed. It was pretty hard going. Not to the level if we had been racing but the big morale killer was looking at the Distance to go (DTG) which was actually more when I came off watch after 4 hours then it was when I started. And before you suggest it the route hadn’t been changed. 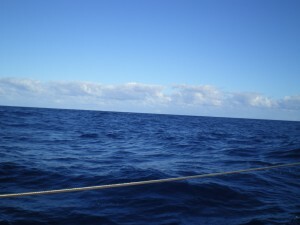 We were heading it seems to the Ross Sea and Captain Scott’s cabin instead of to Chile. Two days before due to route changing at 5am we were 1200 miles to go and at 9pm that night we were 1200 miles to go. It would all be fine if we had plenty of fuel then we could motor south and set ourselves up for a reach into Puerto Montt. But we have 4 days of motoring left in the tank. The last section of 75 miles we will be motoring to get from the ocean through the canal to Puerto Montt so we need fuel for that section. This boat is certainly not a race boat it goes upwind at about 50AWA so the tacking angles are like a square rigger. However, after sitting down this morning and looking at the numbers I am pretty certain that when the rig was put back in last year the instruments weren’t calibrated as we are 20 degrees off the wind on one tack and 130 degrees off on the other tack. Even taking into account waves that is just wrong. I still have to persuade Tim (the captain) of this. But it is pretty important if you are basing your tacking on shifts on TWD (true wind direction) and the TWD you are getting from the instruments is rubbish. This morning the sky got light but there was not spectacular sunrise and it is just gray outside with the occasional mist of rain. However, there was a beautiful albatross swooping around but not for long and also a petrel. As captain I take when to have the halfway party as a very serious issue as there is always the post halfway depression. Different people feel it to different degrees. However, in my experience if you delay the halfway party to a day past when you actually think you are halfway then the second half seems to be going quicker. At the end of the day who really knows what halfway is especially when you are not straight lining it i.e. paccup or atlantic. If you are delivering back from Hawaii or in this case down the coast and you have to sail most of a circle to get to your destination halfway is a hard one to figure out. Is it halfway on lat and long, halfway on mileage or halfway on time? All of those can be substantially different. I tend to always use the time theory and then use the worst case scenario i.e. worst case the trip could be 20 days so have the halfway at 10/11 days it the mileage seems to coincide then great. Anyways I am rambling. Only because my watch partner at this point has ants in his pants and wants to get it done and has commented three times in the last two watches that they distance to go is not going down. Another problem with using the distance to go is that that number changes dramatically as routing changes. Routing will change a lot when trying to work your way around a high pressure system and a large north going current. So here we sit 1151nm possibly to go at our average speed which has been 8.1knots this trip that puts us in late Saturday night. Puerto Montt is reached by going through the Chile Basin over the Chile Rise to Golfo Coronados and then in through a channel between Isle de Chileo and mainland Chile. 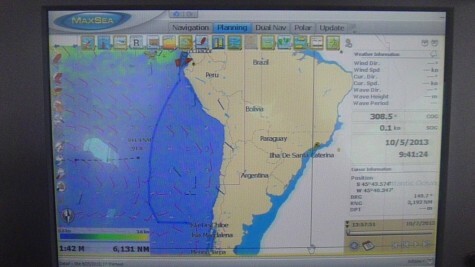 In this channel called Canal Chacao the tide can reach 8-9 knots so there is no going through unless on a favourable. Slack tide only lasts a few minutes! The tidal range is 8m in springs or 25 feet. So we could end up if luck is with us hitting the entrance at the right time. If luck is against us we have to anchor outside at Caleta Godoy and await the change in current. The Canal takes us into Golfo de Ancud then leaving Isle Puluqui to port through Paso Quellin into Seno Reloncavi. We will be at Marina Oxxean with the isla Tenglo across the channel from us and about 2 miles from the city. The pictures of the marina in the pilot book look great. The write up about Perto Montt itself from the lonely planet guide does not excite! But that is 7 days down the road.. The wind has gone right on the nose and looks to be the case for the next 5 days. The sun continues to rise and give OK displays but what is cool is having the light of the moon from the stern at the same time as the sun appears on the horizon off the port bow. 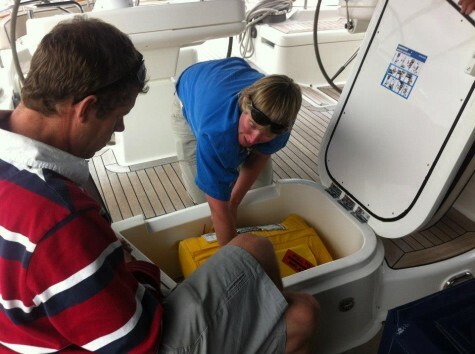 We have 5 days worth of fuel but are hoping not to use it as this motor sailing is not as fun as sailing. In the meantime it is very lonely out here. We last saw a ship 15th and it is the 20th prior to that we saw one on the 11th. They were probably wondering like us what a boat was doing out here. Haven’t seen any wildlife for about the same amount of time it was over a week ago that we had an albatross around otherwise there has been no wildlife. The other news is I will have run out of cornflakes by Tuesday which is a little bit of disaster as I have run out of fresh fruit for my morning yoghurt, cornflakes and fruit. Guess I should have added a few more bags of cornflakes to my supermarket cart. And so life continues on the 6-8am, 12-4pm and 8pm-midnight watch. We are 6 days into what is most likely an 18 day trip from Ecuador to Puerto Montt. 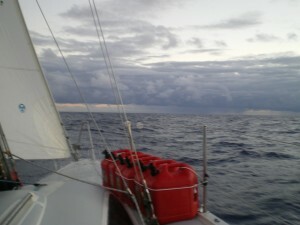 We are moving along at around 200 miles a day 60 AWA in another 2 days we will run out of the trade winds and it will be time to motor across a ridge with less than 10 knots of wind. The south pacific high is moving around quite a lot and is currently meant to split but we are looking so far out it is not worth banking on anything. By tomorrow we will be opposite the northern Chilean border. I have been reading the Chile lonely planet guide to come up with some fun weekend trips away from the boat. Looking forward to climbing a snow topped volcano, visiting the Yosemite of Chile and spending time at an island nature reserve. It is going to be stunning. Looking forward to Christmas time in Tierra del fuego where I am hoping to do the Dientes trek a 53km most southerly trek in the world. We have had a little excitement with the pin dropping out of the vang in the middle of the night. Bit of a fire drill to get it stabilized before the hydraulic lines split apart. The vang on this boat is about a ton to heavy for two people to lift. So I ended up in the dark on the end of the main boom to disconnect the topping lift and use it to hold the vang up while we found something to take the place of the pin. We now have a ¾ inch drive that is normally used as the manual furl for the main the shaft is a little too small for the hole but it is plenty strong! There hasn’t been much wildlife really to speak off besides one albatross which paid us some attention for an hour and then got bored. Also a tiny bird landed to rest and ended up in the pilot house. After defecating on the leather the captain had me banish the poor bird back outside. I can’t see that it would survive out here 1000 miles from land. The small petrels have been skimming the wave tops putting in a foot and wing every now and again. I have been spending time replying to lots of emails, organizing lists of items to get for heading to Antarctica and going through photos that are over 4 years old. As usual Vivid is luxurious with three square meals a day and no need to put on foul weather gear as the pilot house is dry and temperature controlled. Every now and again it is necessary to head outside to trim sails otherwise the day merges into one watch after another. I suspect we will be landing in time for the weekend after next hopefully we will get in on a Thursday giving us Friday to clean up a bit and then have a few days off in Patagonia. So we are heading off today to move the boat south from Ecuador to Chile. 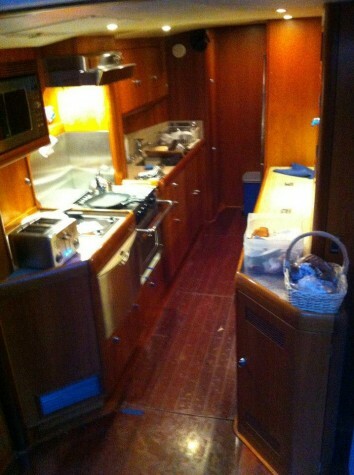 27m yacht all loaded up ready to go with food, water and fuel looks to be like a 19 day trip. As you can see from our proposed routing we will be 1000 miles offshore to get to the west side of the south pacific high pressure system and offshore of the Humboldt current. The current is a cold low salinity ocean current flowing north along the west coast of South America from the southern tip of Chile to Northern Peru which can extend up to 1000 miles offshore! Unfortunately we won’t be stopping at Easter Island. As it creates a large amount of upwelling it is one of the most productive marine ecosystems in the world as the cold nutrient rich water is full of nutrients. We expect the first few days will be dodging fishing vessels as up to 20% of the worlds fish catch comes from the Humboldt current. It is the opposite of the gulf stream decreasing the temperature of Chile and Peru. 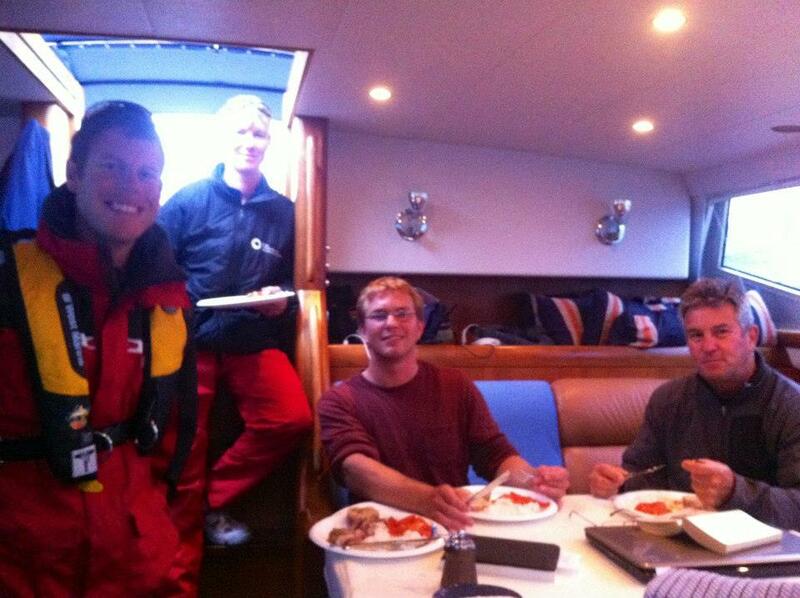 Paige, James, Pat and myself went up to Seattle last week and met up with Chad aboard the Oyster 82 Darling. I haven’t been to Seattle that I remember (I am sure I went as a kid) but unfortunately there was no time to hang around as we had a delivery to do so we went from the airport to the boat. Most pictures below are by Paige Brooks. Before leaving the dock it was time for a safety briefing to orientate everyone to where safety equipment was and what we expected in a emergency situation. In the lock to get out to the ocean from Lake Union no wiggle room! 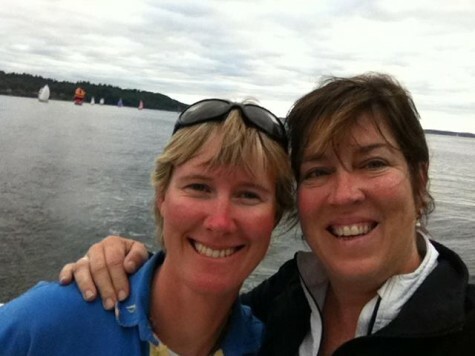 Paige and I on Puget Sound with boats racing the monday night series behind. 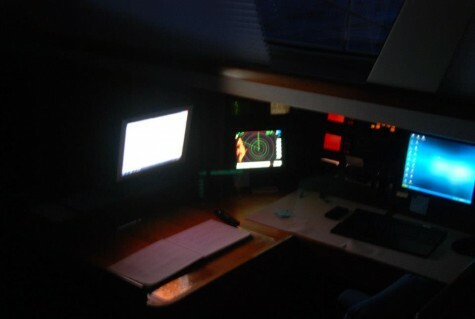 This is the nav station on the boat. On watch somewhere along the coast. 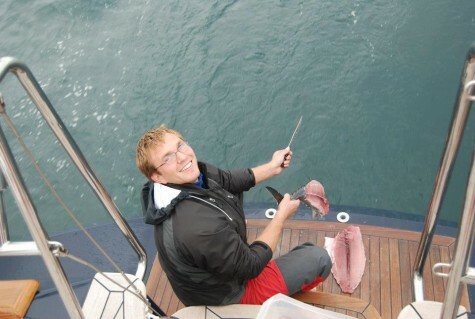 Chad having filleted his tuna on the swim platform. Humpback whale waving hello with fishing vessel behind. 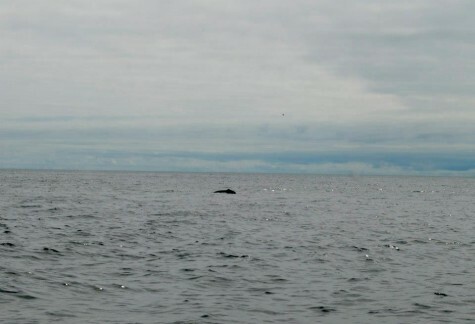 Another humpback whale – there were quite a few. It was great to see wildlife again as it has been very sterile the last few years I have been out there. 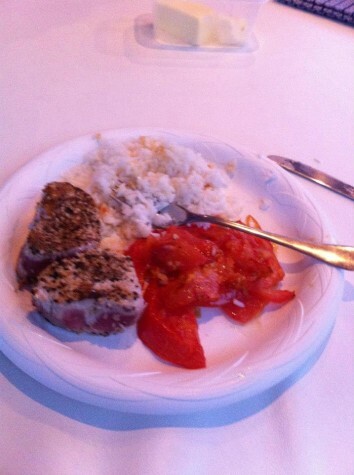 Fresh tuna served courtesy of Paige and Chad. The galley aboard the boat where Chad and Paige made many delicous things. 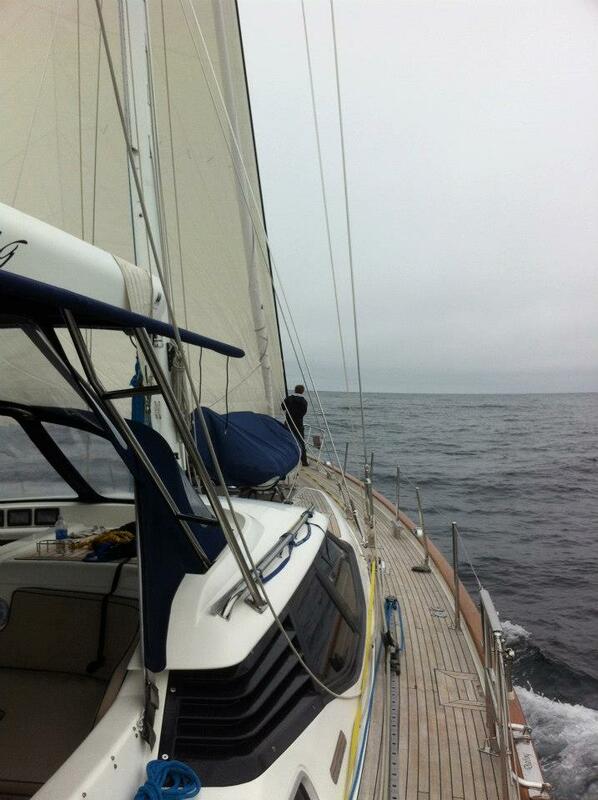 We did a lot of motoring downwind in light air sometimes with the jib and only a few hours with the main. So Charlie asked several times what sea turtles eat and I didn’t really know the answer. Nor do I really know what type of turtle we rescued from the fishing net. I have sent the picture off to turtle experts so that they can tell me. You can have a look and see from the picture if you can ID it by using the Sea Turtle Conservancy site. 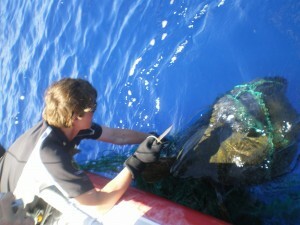 Check out the website http://www.conserveturtles.org/ for more information. 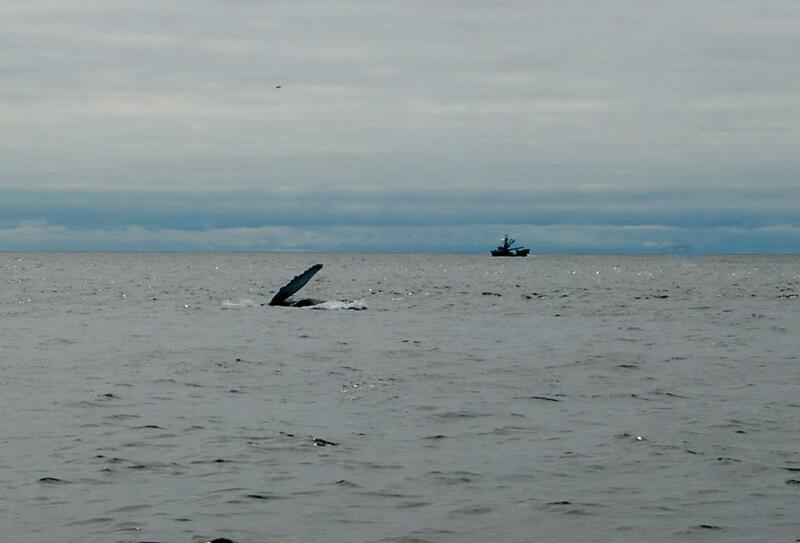 I have to say it was the highlight of my pacific adventures during July and August. Our last roll call as we approach the golden gate bridge with less than 50 miles to go. We are starting to see a lot of sea birds and clumps of kelp are going by. It has been a good trip and all the crew I got from the Pac Cup website have worked out really well. For one I know it is a lifetime experience that won’t be repeated, for another it is the start of his offshore career and for the other I think he will continue to look to do a trip like this every few years. There is always a feeling of accomplishment no matter how many times you cross an ocean when you get to the destination with the boat intact, everyone in one piece and happy. This was my sixth crossing and definantly the most benign with the most amount of sleep and the least time spent motoring. I think the crew got what they wanted out of the trip including some spinnaker sailing for about 7 hours on Sunday in pretty perfect conditions. We had to catch Green Buffalo so we crept up nice and steadily so as not to cause a stampede! It is touch and go as to whether Ed or I will win the bottle of wine if we average 7 knots from here he has it by 45 minutes! Through out these trips as I explained to my crew you go through differentmental states about the distance to go and the distance you have come. At some point you just get into a rhythm and really it doesn’t matter how much longer you are out there unless it is really miserable conditions. I was very much looking forward to being on land for more than 5 days until it dawned on me on Saturday night that I only had 4 (potentially 3) nights left as boat captain on the ocean for what is likely to be almost 20months. I will leave San Francisco on the 12th September and not come back till January 2012 and I leave the UK for South Georgia on the 18th November. While on this delivery I was sent an email with the dates – it will take 10 days from London to get to King Edward Point as I go by sea from the Falklands. So stay tuned. The next few weeks of posts will be about my adventures trying to enjoy everything the US has to offer before heading to Europe. Then you will hear all about my training for going south and last but not least there will be a 13 months of posts from South Georgia. So now time to enjoy my last partial night at sea hopefully there will be some stars out though I can’t hope for a moon. It is likely however, that we will be bucking the tide coming in the gate under a cloak of fog listening intently to VTS for incoming and outgoing traffic into the bay. Thanks for reading. 205 miles to the South Tower of the Golden Gate the breeze is up to 20 gusting 25. 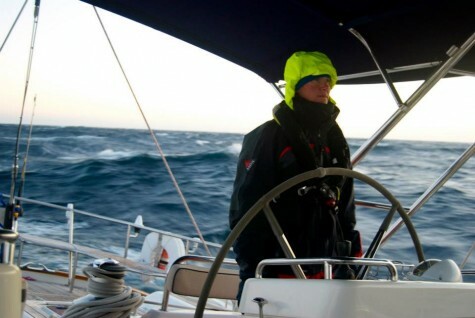 It has been like sailing in the UK today all gray, cloudy and rainy. Seas are coming from behind and from the north so we have a little cross sea. 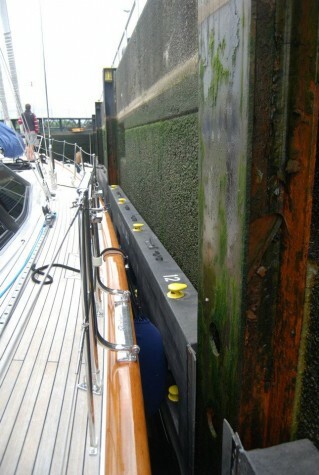 The compass we resealed is leaking again into the aft bunk! Oh well it is only one more night. Dinner was jazzed up noodle with carrots, pesto, onion and chicken breast. Starting to see lots of signs of civilization in shipping traffic and when it wasn’t cloudy this morning lots of airplane contrails. 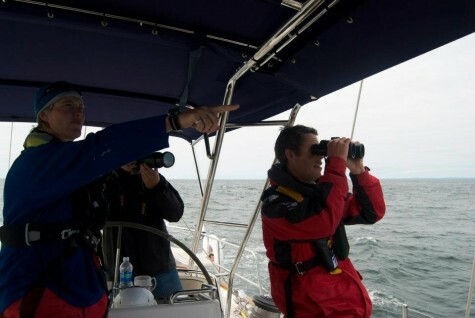 We have pulled 6 miles ahead of Green Buffalo and were able to talk to them on VHF instead of SSB. We are under one reef and the number 4 and they have a full main and the working jib. Looks like it is going to get light about 70 miles ahead so it might come down to who has the most horsepower in their engine to displacement. This is my last full night in the ocean for a long time and I am looking to enjoying it except my foulies decided to give up the ghost so I might get into Oliviers which he left aboard! When I came up on deck yesterday at 11:45am we were socked in a fog bank with 15 knots of wind dead behind. Then the fog cleared but it stayed cloudy and it was time to hoist the spinnaker and give the crew a break from the boredom of the engine. The mood lifted when I yelled down to everyone to get up if they wanted a kite up. 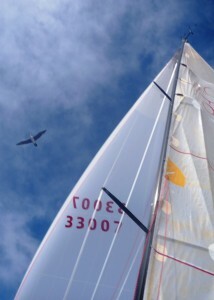 We changed to 3 hours on 3 hours off for the period the spinnaker was up. I taught Charlie how to wool the kite and I realised it was a good thing we were putting the kite up because it was still full of grass cuttings from the lawn at Kanehoe YC and still a little damp from when it had been washed. So we crept up slowly on Green Buffalo making sure not to spook them and cause them to stampede! At roll call we were 60 miles south of them at 38 06 and 4 miles aft of them. Coyote is 60 miles directly on our stern so there is no chance of them catching us. As the wind went forward we doused the kite making sure to keep it dry and went back to a more relaxed 1.5 on 4.5 off and the very familiar droning sound of the engine. So we are now under 300 miles to the dock at RYC and the crew is looking forward to it. The only other thing to report is that I got to wash my hair again yesterday – it really does make you feel more human! Looking like Ed could be getting the bottle of red wine as we might be closer to his ETA then mine at the bridge! We could always throw a bucket over to slow us down.. Sorry Dee with the spinnaker going up it looks like an early morning arrival at the dock. Don’t worry I don’t expect to see you till a more reasonable time by which time we won’t be so smelly aboard! Many jerries of fuel to be used! Well we did that days ago it seems and are still motor sailing. Yesterday it cleared into a warm sunny day and after a beautiful sunset I thought we might get a night full of stars. 45 minutes into my first night watch the stars had been replaced with a blanket of cloud and when I came up for my second watch we were in damp dense fog. Yesterday morning the wind shifted to the west which was not predicted by the grib files. I am not sure why I am surprised as the GRIB files haven’t made sense this whole trip! We keep on getting enticing wind reports from the boats ahead at roll call but by the time we get there there is nothing! I am pretty glad I loaded up with fuel at this point. We could actually motor all the way to the dock! The next laugh was when green buffalo asked if we had caught up with them yet. We have closed the gap and have been daily. Then he mentioned that Coyote, Buffalo and Rhum Boogie are all in the same harbor and it was a race to the showers. Well that is like putting a red flag to a bull with me 🙂 I said well you have water line length (Buffalo is 40 feet and Coyote 42 feet) and your engine has more horsepower. He mentioned we had larger sail area to displacement – he has a point…. however, he has an autopilot and has hand steered only 3 hours of the trip so far where as we have hand steered 100% of the way. Anyways he said – I didn’t realise it was a race to the dock – at which point Doug off Delicate Balance said – are there more than two boats on the water! So now it is game on. My crew want to see the spinnaker so in the interest of education and to stop the ringing in our ears from the engine we might have a go for a few hours this afternoon with the big mother. We have also decided there should be a delivery race back from these trips and the handicap should be decided by fuel used, number crew, autopilot hours, customer satisfaction (i.e. crew grading the skipper), water line length, fish caught etc. You get bonus points for rescuing sea creatures and demerits for needing outside assistance like Deception requiring a battery from Hula Girl. Also we want to pass the Farallones at sun up on the 11th as there is no point in getting in in the middle of the night on the 10th/11th. 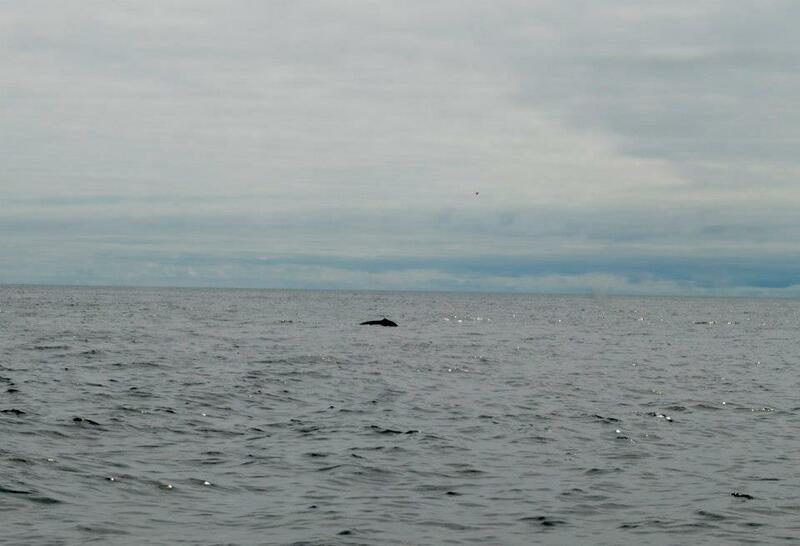 Position today is 38 10N 132 11W we have green buffalo off to port and coyote off to starboard so we are going to head them both off at the pass!